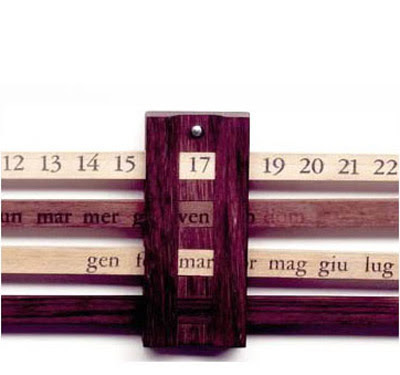 An elegant and scluptural perpetual wall calendar designed by the multi-talented Enzo Mari. The clever design of the Calendaria Bilancia allows for the date to be revealed via the strips of varietal wood. Offered in English and presented in a Danese gift box. I WANT that calendar, or, I want to make one. The whole reason I have never used calendar's is because i have been looking for that one!